Rendering of proposed mixed-use building at 130 Seventh Avenue South, Manhattan. Image Credit: Gruzen Samton Architects. Application seeks to replace one-story structure with new residential, ground-floor retail building. 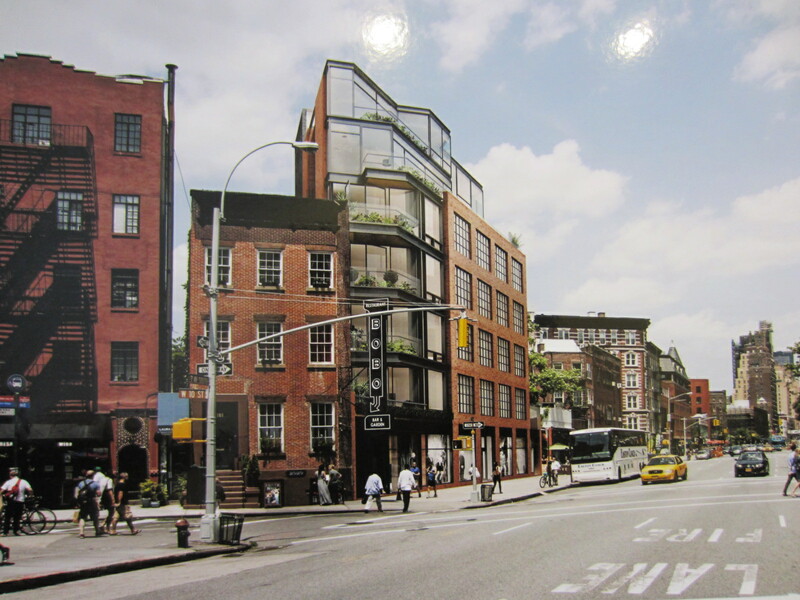 On July 9, 2013, the Landmarks Preservation Commission held a hearing on a proposal to demolish a building at 130 Seventh Avenue South in the Greenwich Village Historic District, and build a new seven-story building at the site. According to Landmarks’ district designation report, the existing building was constructed in 1937 after the southern extension of Seventh Avenue, to the designs of the firm Scacchetti & Siegel. The subject lot is triangular in shape, created by the construction of Seventh Avenue. The building would be residential, with ground-floor retail. Jane Gol, president of Continental Ventures Realty, which is developing the site in conjunction with the Keystone Group, testified that the plan was as-of-right and would be “sensitive to the distinctive nature and character of the Greenwich Village neighborhood.” She said the building would serve to restore the residential character of Seventh Avenue South, and the building would meld with the neighboring townhouses. The plan was presented by Gruzen Samton’s Peter Samton, and architect Robert Santos. Samton characterized the existing structure as “taxpayer” without an identifiable architectural style, and Santos said that it had been altered repeatedly since its construction. Santos added that the building was anomalous in an area largely characterized by three- and five-story residential structures. 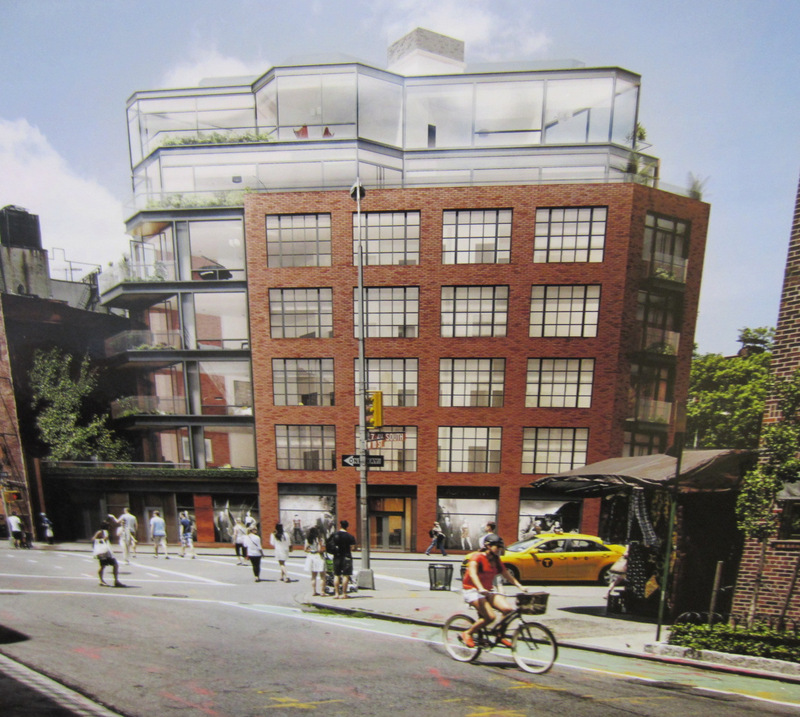 The proposed building would rise to five stories at the streetwall, with the overall height in line with historic tenement buildings in the district. A two-story penthouse, set back slightly from the front facade, would be faced by a glass curtain wall. The masonry portion would possess large casement windows, adding an industrial component to the building’s design. The lower five stories would be primarily clad in red brick, a material common to the district. The western edge of the building would be faced in glass; a design element Samton said was intended to recall the impact of Seventh Avenue South on the street grid of Greenwich Village. The building would have projecting balconies on the north facade, and Juliet balconies on the south. The building would rise to a total height of 75 feet. Image Credit: Gruzen Samton Architects. Landmarks heard numerous residents and others testify both in support of and in opposition to the plan. The Greenwich Village Society for Historic Preservation’s Amanda Davis argued that the proposal “attempts to fit too much onto such a small, irregular lot,” and that the project should be scaled down and redesigned in a manner more harmonious to the district. Preservation consultant Gregory Dietrich, retained by the Compact for Urban Site Preservation, testified that the existing building possessed historic and architectural interest, as an example of “vernacular Moderne style,” and should be protected. Dietrich further testified that the proposal would have “an adverse visual effect” on the historic district. Resident Henry Landau called the proposed building an “out-of-scale, out-of-style monolith,” while neighbor Alan Fried said the design would be more appropriate to DUMBO, and that the proposal’s size threatened the low-rise character of the district. One neighbor said the glass penthouse would look like “a flying saucer” when illuminated at night. Other speakers expressed concern about the development’s impact on trees growing on the lot, the loss of light and air to nearby apartments, and the increase in traffic that the development would bring to the area. Resident Evan Hollander said the proposal, if built, “will bring vibrancy to that corner,” and that the avenue location could sustain the project’s height. Resident Ken Brandman said the existing building had hosted a series of failed businesses, remained vacant for long periods of time, and done nothing beneficial for the community. Several other residents echoed these testimonies. Samton responded to the testimony by saying existing trees would be protected and incorporated into the plan, and reiterated that whatever architectural distinction the existing building may have once had, was already lost through repeated alterations. Jane Gol said the proposal was “modest” in the context of Seventh Avenue South. She thanked residents for commenting, and said the owners would seek to address their concerns at a later meeting. Since the hearing extended past the Landmarks meeting’s scheduled end time, Chair Robert B. Tierney closed the hearing without commissioner comments. Chair Tierney said a meeting to revisit the proposal would be scheduled soon. LPC: 130 Seventh Avenue South, Manhattan (13-5467) (July 9, 2013) (Architect: Gruzen Samton Architects).